Beautiful new villa, surrounded by its own garden, and immersed in the fields but very close to the city center. Equipped with every comfort, latest generation appliances, spacious and quiet. swimming pool with counter-current swimming, heated and with hydromassage, separate hydromassage Jacuzzi tub for 3 persons, infrared sauna, curative for rheumatic pains, turkish bath. 4 large bedrooms with private loggia, 4 bathrooms, large kitchen complete with all appliances, laundry (washing machine, dryer, freezer) large double covered parking, living room, study lounge, indoor planted garden covered. outdoor area complete with barbecue, oven, table and gazebo. Class A, solar and photovoltaic panels, absolute respect for the environment, anti-seismic structure, underfloor heating with independent thermostats and cooling in every room with independent split. We are lucky we can cut out some free time , it's because of our work , by persons who do not constrain the times , both aproffittando that our daughter , yet little can travel like crazy , waiting for the completion of six years of age , at which time will have to go to school . often leaving the house free , we said: why not rent it , ? our holidays may coincide with the holidays of some family or more families together who decide to spend a few weeks in a beautiful city in northern Italy ! The villa is ideally suited to the reception of 8 people , in full comfort and independence, it was built respecting the best architectural quality and earthquake-resistant and renewable energy sources . With swimming pool with counter-current swimming and water heating , we wanted to make the most of his chance to use also the hot tub with hot water and color therapy , along with infrared sauna and turkish bath wrap up our week end , a taste of total relaxation and body care , despite the cold weather of this area . The large kitchen and spacious bedrooms are fully enjoy every moment spent in the house , where it is warranted , we rest and again completely regenerated for a fresh start after holiday / weekend !! Two couples shared this great house just a ten minute drive to the old town of Parma. Modern nearly new home with every imaginable electronic convenience. Beautiful pool, nice hot tub and even a sauna. Wonderful kitchen. Host very helpful. Siamo davvero felici per la vostra recensione. Anche per noi e' stato un piacere ospitarvi. This place was even more beautiful than the pictures. We had high expectations, and our expectations were surpassed. It is brand new, as clean as it gets, with an amazing pool, sauna, and Jacuzzi, 4 spacious bedrooms, 4 washrooms, a kitchen with everything and anything you need, even a prosciutto slicer, outdoor barbecue, and dining space either inside or in 2 different places outside. The entire house is equipped with all the technology you need, with solar power, automatic opening front and back gates, alarm, WIFI, TVs in every room. It is located in a wonderful country area of Parma with relatively new construction in the area, and very central especially if you are looking to visit the mid northern part of Italy, just minutes away from downtown Parma and from the highway, to get to Milano, Verona, Bologna, Modena, Maranello, Cinque Terre to name a few that we visited. And best of all, we met the owners, and we could not have been treated any better, they were very gentle and had a sincere desire to ensure that their house guests had a perfect stay, providing us a personal tour of everything we needed to know about the house, and were accessible for any advice we needed for restaurants and things to do in the area. We could not have asked for more! This place was so amazing, that we even modified some of the destinations we had planned to visit so we could have a bit more time to just enjoy the pool and all of the amenities. We would most certainly rent this Villa again, and would recommend this to a friend. Siamo colpiti da questa nostra prima recensione. Ci ha fatto piacere sapere che i nostri ospiti si sono sentiti a loro agio. Abbiamo instaurato un rapporto cordiale e direi quasi di amicizia oltre che di rispetto reciproco. Spero di ri incontrarli presto ci farebbe davvero piacere. Mijn man en ik en onze 3 zonen hebben een aangename week doorgebracht in deze prachtige villa. Het huis is heel netjes, mooi ingericht en van alle comfort voorzien (o.a. overal airco, TV en automatische rolluiken). De keuken is groot en goed uitgerust. Mooie tuin, groot zwembad met springplank, houtbbq en pizza oven. Vriendelijke en behulpzame eigenaars, echter alleen telefonisch contact gehad. Minpunten: overdag niet altijd zo rustig buiten. Het huis ligt vlak naast een groot tomatenveld en een langweg waar er nogal wat verkeer is. Eén dag was er ook veel lawaai van de generator van de waterpompen die het tomatenveld besproeiden. Ook waren er niet voldoende ligstoelen aan het zwembad (er waren er 2 kapot). Wel 4 ligstoelen voor kinderen. De jacuzzi werkte spijtig genoeg niet en we hadden 2 dagen geen internet. Tweemaal is er iemand langsgeweest voor reparatie, helaas zonder resultaat. 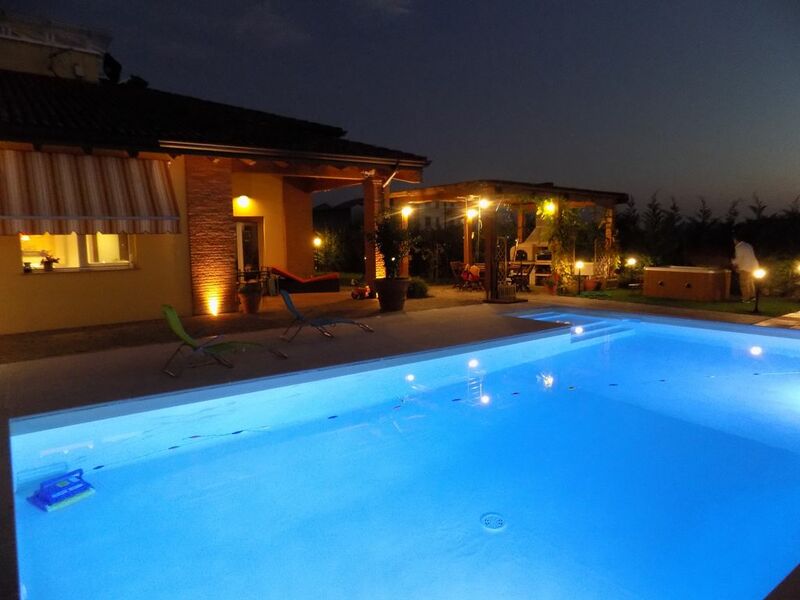 The Villa is located in the very first outskirts of the city, about 2 km from the center of PArma, immersed in the countryside, surrounded by silence, is the ideal place with its swimming pool and Spa, to relax and find a piece of paradise! The city of Parma, Emilia Romagna jewel, offers all kinds of attractions for young and old, from museums to theaters, the tasting of typical products to the most extreme sports, from mountain walks, shopping in the city or in the nearby Outlet Fidenza Village. And 'surrounded by Terme, for wellness programs, among them, Monticelli Terme, 8 KM Salsomaggiore Terme and Tabiano 25 km. For good food lovers are spoiled for choice from the meat to the first, from appetizers to desserts, accompanied by good wine and sweets. In addition, the hospitality of the people, the ease in the movements, and the endless amount of things to do, make a stay at Parma really Unique !! !